Welcome back. Maybe you remember. A couple of years ago, I blogged that my wife Vicki, like many or most people who have owned or raised or been close to horses, can usually tell from a horse’s actions and facial expressions if the horse is happy, sad, tired, hurting or the like (Horse Facial Expressions). I didn’t know if all horses exhibited the same expressions or if Vicki and the other horse readers would concur on their interpretations of those expressions, but there was a new systematic way to describe a horse’s facial expressions, the Equine Facial Action Coding System (EquiFACS), which was the subject of that blog post. In that post, I also confessed--confessed is probably too strong--I know little about horses. I’ve only ridden one a few times in my life, and the last time was 35 years ago--a 10-minute trot in northwestern China. You, of course, wonder where this is going. 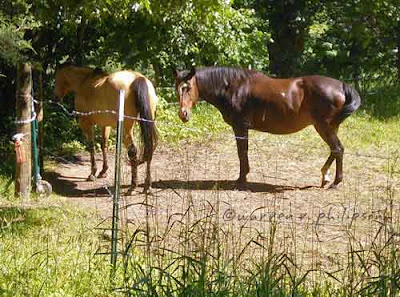 Well, the folks who are renting the barn and pasture to raise beef cattle and formerly chickens and a goat that hung out in the cattle trough (see Roosters’ Crowing) occasionally bring in two horses to graze. One of the horses, Suzie (or maybe Susie), was here last year, and we communicated a bit when I passed by on my afternoon stroll. This year, Suzie has been standing away from the road, enjoying the company of the other horse, which I haven’t met. Vicki said her name is Misty. Suzie (L) and circular-tail-swinging Misty. I see the horses when I walk by, and I can sometimes see them through the trees and brush from one of our apartment windows, though that gets harder to do as the vegetation thickens with the season. Here’s the thing. Misty is always swishing her tail. Always. What caught my untrained eye is that it’s not just any side-to-side swish. Misty often swishes her tail in a full 360-degree circle! (I’m pretty sure that deserves an exclamation point.) I had to know what swishing a tail in a circle meant. I didn’t conduct a comprehensive review of equine literature or interview veterinarians, horse handlers, horse whisperers or even equestrians; but what I learned is enough for this eclectic blog. -Keep warm. If cold, a horse uses its tail to prevent heat loss from the area under the tail, and it may bring its tail all the way between its legs to cover more. A horse’s body language can get quite involved. I’ll limit myself to tail swishing, which is involved enough, for it can relate to the horse’s physical, mental or emotional state, or to any combination thereof. The consensus is that a horse swishes its tail when it’s agitated, uncomfortable, in pain or out of balance or a rider is out of balance. It’s possible the horse is not enjoying the training or the exercises are stretching its comfort zone. It could be that the horse is confused trying to learn something new or that it’s simply concentrating. A mare swishing her tail near a stallion might be attributed to the mare being--or not being--in heat. And, yes, the horse may be swishing its tail to express pleasure or contentment. There are many reasons why a horse might swish its tail. While excessive or violent swishing is likely a signal to stand back, the context must be considered. If I consider the context, I think it’s clear that Misty is absolutely thrilled to be with Suzie, who’s much more interested in Misty than in saying hello to me. Now, as to why Misty swishes her tail in a circle, I haven’t the foggiest idea. I’ve blogged how the lack of symmetry in dog tail wagging was linked to the left and right sides of the brain (Dog Tail Wagging), but that’s left and right, not circular. If you have some thoughts on it being more than just because, please share them with me, the horse tail watcher. Thanks for stopping by.